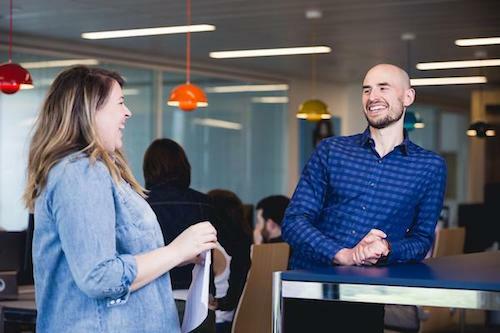 One of the seemingly easiest pieces of building a successful business is typically one of the toughest, and that’s communicating with employees. Keeping employees in the dark is not only bad for the people, it’s bad for business. When we have more opportunities for open and honest conversations with our workers the positive effects far outweigh the fear many leaders have of being honest with their people. More meaningful employee interactions often lead to better engagement, which in turn, boosts morale, loyalty, and most importantly, productivity. When employees are kept in the loop with important company updates and feel respected, they feel more engaged and connected to the company and its mission. This also helps them understand the “why” behind the work. When this trust is conveyed effectively, employees are bound to feel like they have more of a say in company decisions. This fosters a positive environment that will motivate workers to practice better business ethics and improve their quality of work within their team or company. As an employer, you should look to place employee communications at the heart of your engagement strategy. By connecting your workers with your company’s mission, purpose and values, you will boost awareness, interest, and that all-important bottom line. But how can we get employees communicating? Here are some ideas to get conversations and engagement started. In today’s digital world, one of the best ways to connect employees is through company blogs. Blogs are an excellent way of communicating company updates and happenings, as well as its purpose and values. This is a format that is familiar, easily-accessible, and interactive. The ability to involve employees in your company blogging strategy is an important feature for any effective employee communications tool. Look for a platform that can identify and assign blogging administrators and contributors within your organization, and customization that allows for social engagement like tagging, reacting and recognizing from the reader—thus creating a genuine, two-way social conversation for employees. Another helpful tool for advancing and improving the communication within your workplace is employee surveys. Whether you are looking to make simple improvements for daily operations, find resolutions for some workplace challenges, or just want to fine-tune your employee experience – surveys can help gain some much-needed feedback. Surveys are also an excellent means for workers to voice concerns or struggles, without feeling exposed or uncomfortable. Surveys that are quick, flexible, and effective enough to meet the needs of your organization can serve as a valuable tool to measure progress toward your individual engagement goals, as well as the goals of your business overall. When it comes to improving employee communication, it is important to have a point person who can take the lead for a team or company. Do you have a communications role in your organization, or a trusted employee tasked with communication responsibilities? 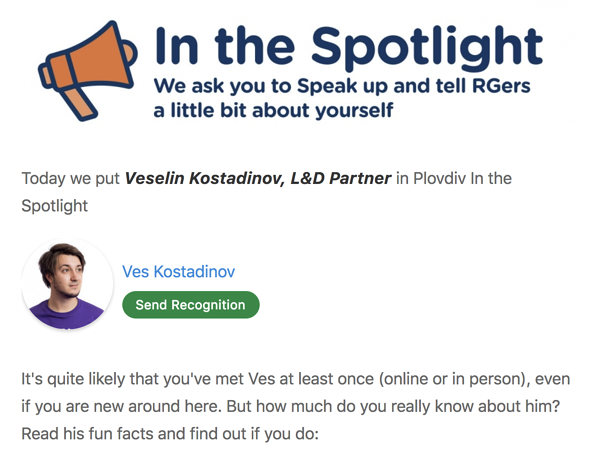 An excerpt from one of our weekly People News blog updates, published on our employee engagement platform, featuring fun facts from one of our L&D Partners, Ves, based in Plovdiv. All too often, companies rest this role upon “managers,” but if these individuals are not equipped with effective communication skills (or tools), there will certainly be hiccups and roadblocks along the way. Hiring at least one employee—or a small team, depending on the size and needs of your organization—can be an incredibly valuable step to improving engagement and successful communication. Centralizing these responsibilities around a point person or team will also help leadership stay aligned in their messaging. Top executives should be presenting a united front. When leaders of an organization work together, support one another, and stay on the same page as one another, it is easier for others to follow suit. Leadership alignment will help workers feel like they can trust their managers and approach them openly with any questions or issues that may arise. Just as these ideas and methods should help encourage employee communication, so should the simple concept of transparency. When a CEO is forthcoming and honest, he or she is setting an example for the rest of the organization. The open-door approach lets employees know that communication is key and that their voice matters. 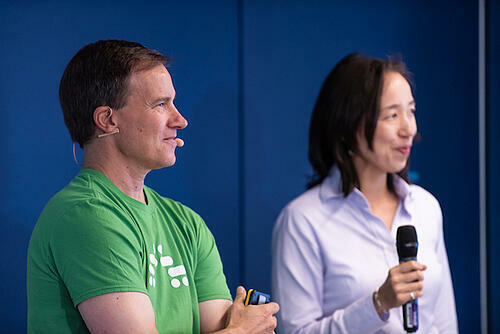 The goal is to align your workforce with an open and honest culture so that everyone within the team can feel confident and move at a more productive pace. With the right set of centralized communication tools and methods, your business can reach these goals and, ultimately enjoy success. Now think about your own employee communication journey. 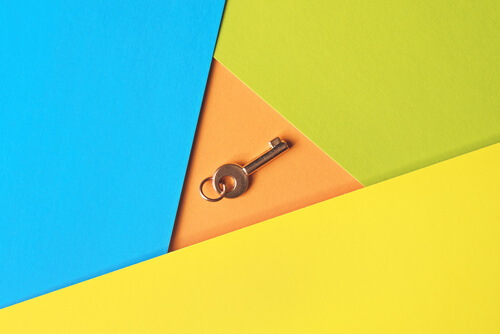 What steps have you taken towards creating a more connected workforce with open communication? Share in the comments below!